Synopsis: “Marley was dead, to begin with…” – and what happens to Ebenezer Scrooge’s mean, sour, pruney old business partner after that? Chained and shackled, Marley is condemned to a hellish eternity. He’s even given his own private tormentor: a malicious little hell-sprite who thoroughly enjoys his work. 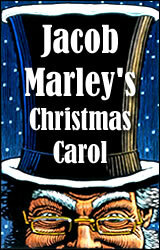 Desperate, Marley accepts his one chance to free himself: To escape his own chains, he must first redeem Scrooge. So begins a journey of laughter and terror, redemption and renewal, during which Scrooge’s heart, indeed, is opened; but not before Marley – in this irreverent, funny and deeply moving story – discovers his own. Showtimes 8 PM Friday/Saturday, 2 PM Sunday. Tickets $12, refreshments provided, doors open 1 hour before curtain.